Are you ready to learn some new and amazing things that you did not know about security camera laws? 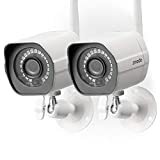 This article will describe three different surprising things you probably did not know about security cameras and the laws that regulate their use in the United States, as well as various places throughout the country with their own laws. This includes municipalities such as cities and towns and also includes counties and parishes. States also have their own laws regarding security cameras individually state-by-state. If you have questions about specific security installation issues in your state, consult with Protect America. As a general rule of thumb, it is always okay to record video in public as long as there is not a reasonable expectation of privacy. These reasonable expectations include places that are assumed to be private such as bathrooms, changing rooms, shower areas, locker rooms, hotel rooms and bedrooms. You can generally conduct security and surveillance measures using video recording cameras at any home or business, even in public as long as you don’t violate those reasonable expectations. The other thing to also keep in mind when you are considering general rules of thumb is that audio recording is not the same as video recording in the eyes of the law and various states have their own specific laws regarding both audio and video surveillance, privacy and the like. It is reccomended that prior to any installation or plans, you get familiar with local, state, county and federal laws regarding home security cameras. The following may surprise you, but these three caveats generally apply accross the board in the United States. The laws regarding your use of hidden video recording devices is not the same as for recording video and you obviously are not allowed to use hidden recordings for the express purpose of blackmail. Specific jurisdictions may have different rules regarding the specific use of audio recordings as they relate to privacy and other concerns in those jurisdictions, according to at least one source online. You can generally use hidden surveillance cameras to record video without the consent of the person. This includes home security cameras installed at your house. Many homeowners decide to get what has been called “nanny cams” to see what is happening at their home while they are away at work or traveling. Many homeowners also get exterior hidden cameras that are either mounted within another decoy item so people do not know they are present, or located in some other place that is hard to notice for the average eyeball. You can get both interior and exterior home security cameras in both hidden and transparent setups, installed by a professional and monitored for your safety and peace of mind. Again, you want to make sure that you are not putting hidden cameras in places where someone would have a reasonable expectation of privacy, including bedrooms, bathrooms and other private use areas of the home. This is a moral and ethical issue as much a legal issue. Businesses need to protect their investments and their personnel, so it is imperative that businesses install a professionally monitored security system for on-premise safety and security. Businesses are not generally afforded the same type of legal leeway as homeowners and members of the general public because they generally consist of public spaces or shared spaces, where there are different reasonable expectations of privacy. Most of the time, a business will need to make employees aware of a security policy and the use of recording devices. This is not always the case, but generally it is protocol. The same is especially true for surveillance of customers, clients, public, etc. Businesses usually need to post a notice letting patrons know that the premises are under video recording surveillance. Companies often show would-be burglars and other threats that they are protecting the business and they leave their sign on premise with their logo.